Do you become enraged when your beer bottles topple over in the fridge? Have you ever wished you could listen to your lectures in half the time? This fully illustrated manual solves your everyday dilemmas, from ways to make your student loan stretch further to revision hacks and much, much more. 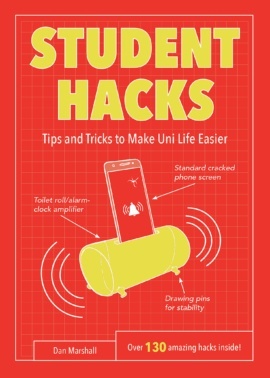 Whether you’re a fresh-faced fresher or a seasoned student searching for shortcuts, this trusty guide will make your uni life easier, more productive, and most importantly, more fun. Dan Marshall is an author, editor and illustrator. When he's not busy with his duties as a loving dad of two, he enjoys DIY and playing the guitar.